The thing I really like about Kingfisher's writing is her gently humorous tone, even when writing about rather horrific things. There's this wry, light humour which is very much my sort of thing. This is very much not a standalone book, but the first half of a duology that stops rather abruptly partway through the adventure. It starts with the rag-tag bunch of adventurers getting together to discover how clockwork monsters are being made, the middle is their journey to the city where they expect to make this discovery, and the end is "ah ha! We have arrived at the city". And hence rather a lot of story is left for the second book. It's a great adventure, with some lovely dynamics among the adventurers. 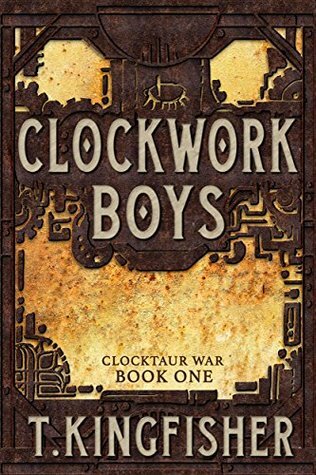 Sign into Goodreads to see if any of your friends have read Clockwork Boys.